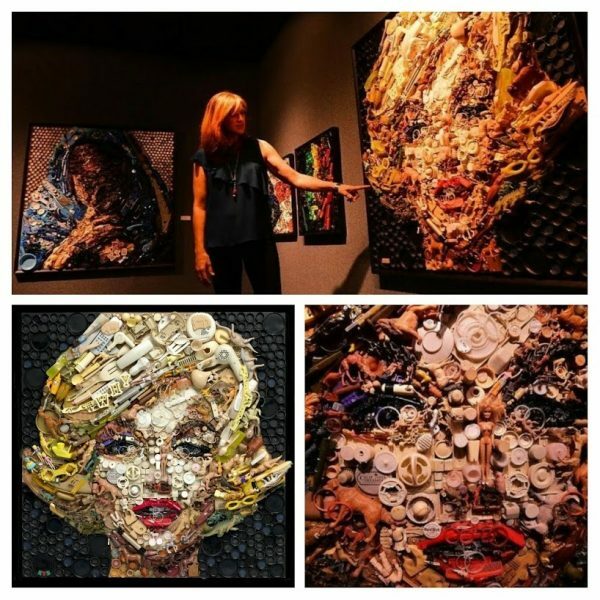 Artist Kirkland Thomas Smith’s portrait of Marilyn – inspired by Bert Stern, and assembled with reclaimed materials – is featured in her new exhibition, Re-Imagined, at the Curtis R. Harley Gallery in Spartansburg (part of the University of South Carolina Upstate) until September 21, as Samantha Swann reports for GroupState. “The series carries an environmental message, which Smith said was inspired by the plastic toys that her four children accumulated. That caused her to think about just how many plastic items people can accumulate, even when trying not to. Before starting this series of work 10 years ago, Smith focused on traditional portraiture. ‘When I was trying to figure out how I could paint a picture of our consumerism, I just didn’t feel like I could make a bold enough statement painting a picture of it, and that’s where I got the idea to just use the stuff as my paint,’ Smith said. Smith said that before starting the project, she, like many people, assumed that all plastics were recyclable. They are not. In fact many are not, she said. The items Smith uses would normally be thrown away — some are items that she or others have saved from trash cans, while others were purchased at yard sales or thrift stores.